The data revealed that after a "challenging holiday quarter" at the end of 2018 global smartphone volumes declined 4.1% last year with a total of 1.4 billion units shipped. In the fourth quarter alone, volumes declined 4.9% with 375.4 million units shipped. "With challenging market conditions continuing into the first quarter of 2019, the likelihood of a declining market this year becomes more of a reality," IDC said in its Worldwide Quarterly Mobile Phone Tracker report. 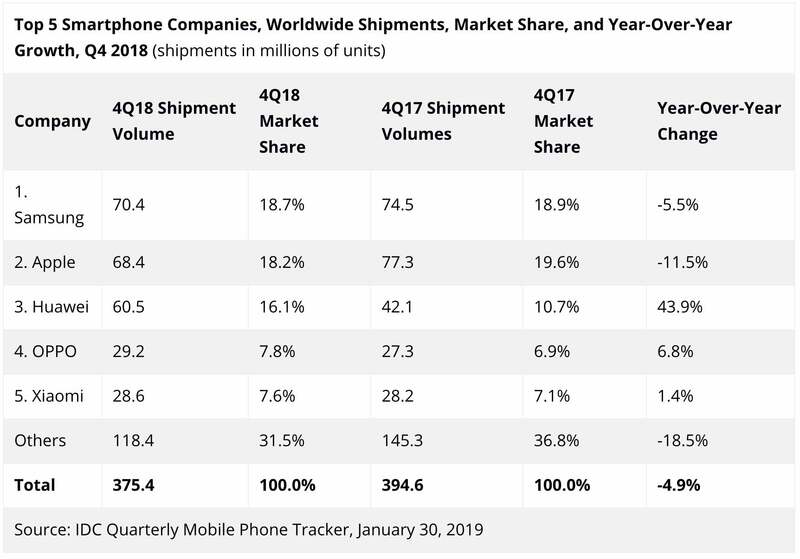 A second research firm, IHS Markit, published its own smartphone sales figures today, and it reported that shipments for the fourth quarter were even worse than IDC's numbers. Global smartphone shipments reached 365.2 million units in Q4, which is a 5.7% drop over the previous quarter. IHS's numbers for the full calendar year, however, were better than IDC's; IHS projects that smartphone shipments declined 2.4% from 1.44 billion units in 2017 to 1.41 billion units in 2018. The reasons behind the declining sales vary and include lengthening smartphone replacement cycles; increasing penetration levels in many large markets; political and economic uncertainty; and a growing consumer frustration about continuously rising prices. "Globally, the smartphone market is a mess right now," said Ryan Reith, vice president of Worldwide Mobile Device Trackers. "Outside of a handful of high-growth markets like India, Indonesia, Korea, and Vietnam, we did not see a lot of positive activity in 2018." Apple was among the hardest hit by declining sales, suffering an 11.5% drop in the fourth quarter despite releasing three new iPhone models. For the full year, iPhone sales were down 3.2%, which makes sense considering its two largest markets – the U.S. and China – experienced the worst year for smartphone sales ever, IDC said. "Apple is certainly not out of the game, but the likelihood of not having a 5G iPhone in 2019 means it will need to tell a strong iPhone and, more importantly, ecosystem story to succeed," IDC said in its report. "If anyone can do it, it is Apple. But it certainly won't be easy when faced with all the other downward market pressures." Apple has limited options in the short term, according to Gerrit Schneemann, senior analyst for IHS Markit's Mobile Handsets, Technology, Media & Telecom division. "It is clear that they are not going to move away from their premium branding and there is not a lot of room for pricing elasticity. So, they will expand on trade-in programs and financing options to bring their premium price to a manageable level for most consumers," Schneemann said. For some markets, the re-introduction of older models might play a bigger role going forward, but Apple seems hesitant to fully commit to that strategy, according to Schneermann. In the long run, carriers might be willing to re-introduce subsidies on some level, even though they have moved away from them in many markets over the last two years. "If upgrades continue to dry up, carriers will also again have an incentive to manipulate pricing," Schneermann said. 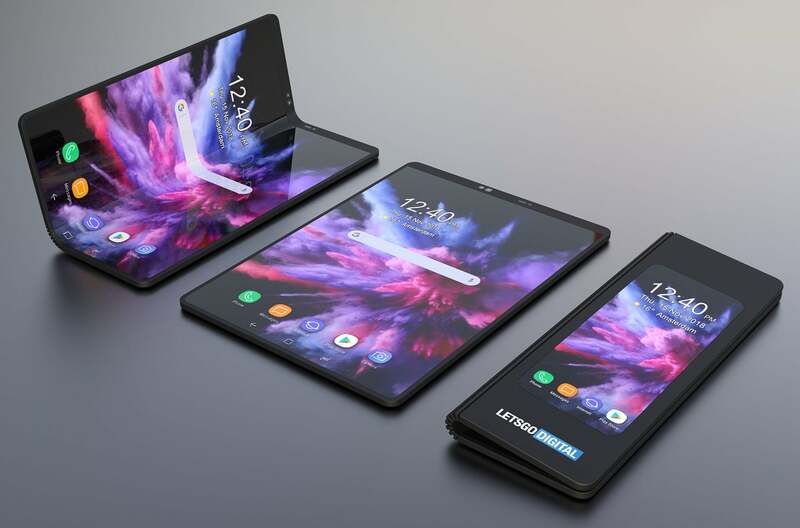 Anthony Scarsella, research manager with IDC's Worldwide Quarterly Mobile Phone Tracker, said the arrival of both 5G and foldable devices later this year could bring new life to the smartphone industry – depending on how vendors and carriers market the real-life benefits of those technologies. Samsung has announced it will be introducing a foldable smartphone this year, but the cost could be as steep as $2,000, according to industry speculation. The company has reportedly been racing to be first in line to produce a foldable phone. In its fourth quarter and full-2018 financial results released today, Samsung said operating profit decreased quarter over quarter (and year over year) due to a decline in both smartphone sales volume and revenue amid "a sluggish smartphone market overall." While its smartphone sales were down, Samsung said it "aims to lead trends in the market by launching foldable and 5G devices in efforts to ensure sustainable growth." Samsung will unveil the Galaxy S10 next month at the Unpacked event in San Francisco; its new flagship model smartphones are expected to prop up sales and business performance in the coming months, the company said. Samsung saw smartphone volumes decline 5.5% in the fourth quarter with total shipments of 70.4 million units. While that was enough to maintain the top position for the period, its market share once again fell below 20% to 18.7%, just a few points above Apple and Huawei. 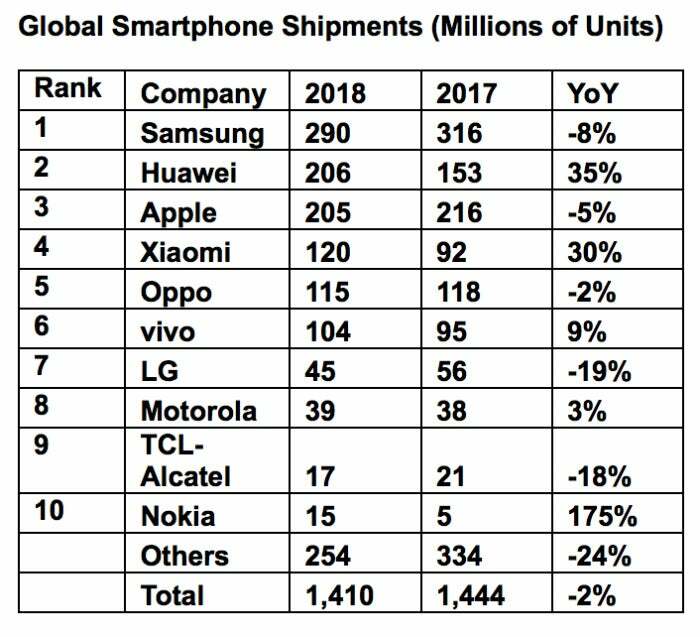 Huawei, meanwhile, was one of three of the top five smartphone makers to see a sales increase last year, with shipments ticking up 33.6% in 2018. "Huawei continues to see growing success from its Honor line of devices, which are now representing close to half of its overall volume," IDC said. 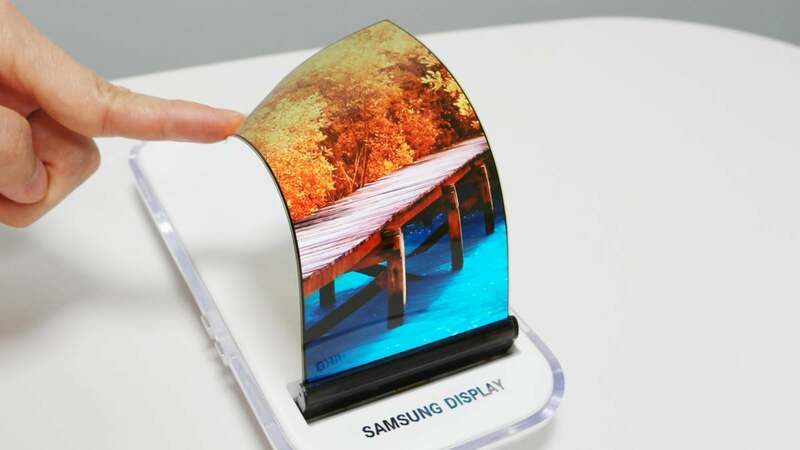 Samsung Electronics is expected to release foldable smartphones this year with flexible displays supplied by affiliate Samsung Display. China represents about half of Huawei's smartphone business, but that is slipping as the company continues its global success with growth in almost every international market where they participated in 2018, according to IDC. Additionally, Huawei is expected to reveal its own foldable smartphone at the Mobile World Congress in Barcelona; a news conference is scheduled for Feb. 24 for that announcement. As new model phones are released, however, average selling prices are expected to rise as new displays, chipsets and radios bring higher costs to the build of materials, according to IHS Markit's Schneemann. "To combat this, carriers and retailers will need to fully maximize trade-in offers for older devices as a type of subsidy to push upgrades throughout 2019," he said. Overall, the replacement lifecycle for smartphones is increasing, mainly among consumers. Corporations that purchase smartphones for workers tend to rely on longer time frames, not on an annual or even two-year upgrade cycle. Where pricing could turn out to prove more attractive this year is when smarphone makers take a more niche approach to their handsets, focusing on use cases and delivering the hardware to support that. "This could mean a mid-range device with many camera lenses, but not top of the line screen, or a smartphone with a large battery but with other compromises," Schneemann said. "Instead of having to look for a flagship with premium pricing, enterprises might find a good solution in the mid-range, because of a changed portfolio approach by [equipment makers]."